A spa bathtub in the corner, at the side or simply standing on the floor in the centre of the room could make the guest think “this is just like at home”. In order to prevent this impression, spa bathtubs literally need to be “presented” to the guest. Sometimes, this goes even one step further: Among all treatments offered by a spa, the bath in the simple tub is displayed in the most exquisite way possible. The form, design and material of the bathtub are so spectacular that the guest will find particularly memorable. If there is a bathtub in a spa it is often the flagship of the whole spa. This is the reason why the room where the bathtub stands sometimes even excels the spa itself: it becomes a “spa in the spa”. 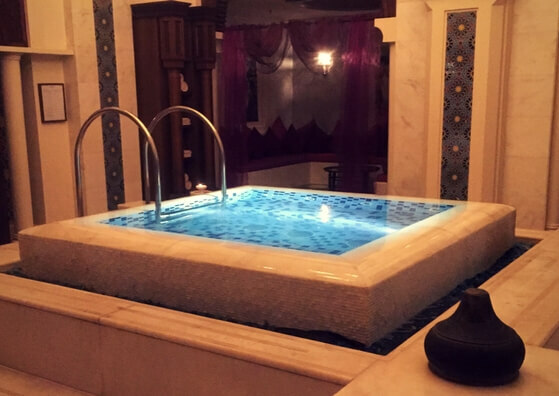 The bathtub is presented on a kind of gallery, like on a serving tray, as if the spa would like to express “this is our special gem for you”. Everything in the room visually highlights the bathtub and enforces its beauty. Right in the centre, in the rear third of this “work of art” is positioned the bathtub, the eye-catcher, transversely towards the entrance where it shows itself in all its glory. The guest comprehends: This is something that I cannot have at home. This bathtub here is something really special. The bath in a spa is no mere experience, it is an event! This is why, if a spa is to be gradually renovated, you should start with the room with the bathtub. This room is the focal point of all further renovations. EuropeSpa Expert tip: Now you might ask whether you should at all offer a simple bathtub without any air, light, whirl or other effects? “What for?”, an investor or manager might wonder. I highly recommend it, though, because a simple bathtub “gets to” the guest. They can compare it with something familiar and clearly see the difference to the usual. And if the bath succeeds to surprise them they will be convinced of the whole experience. Posted in Hotel Spa, Medical Spa, Quality Management.